Zoom imageShetland jumper Stephen Whitefield, who describes himself as a bit of a charity shop addict ,was browsing a Fara Charity shop in London's super posh Notting Hill Gate when he came on a "lovely old Shetland jumper", for the the princely sum of £14. Stephen was interested to find out more about it. 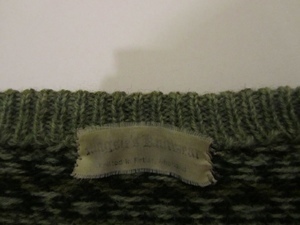 The label read “Magsie’s knitwear, Knitted in Fetlar, Shetland”. An internet search lead him to www.fetlar.org and we in turn put him in touch with Magsie Leaper who knitted the jumper, she thinks around 30 years ago. Magsie told us it was probably made originally for a family who own a house on Fetlar or one of their guests, for whom she had made several all over jumpers around that time. With their Shetland Wool jumpers they also got detailed instructions on how to look after them and several of them bought jumper boards for that purpose. Their care seems to have worked as after around 30 years the jumper, according to Stephen is still in very good condition and has plenty of llife left in it. 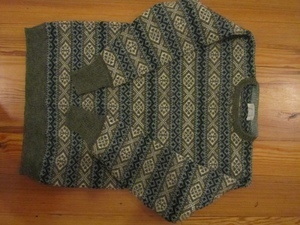 He said he was attracted to the jumper as he liked its traditional design and the lovely earthy greens and greeny/blues. Stephen is delighted with the find and being avble to find out more about the jumpers history. Magsie was delighted to hear her jumper was still going strong. 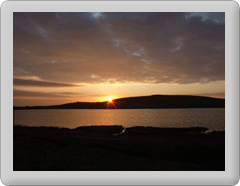 A fitting tribute to her skills and the quality of Shetland wool. She will be passing on the care information to Stephen to ensure he gets many years of use out of his 'new' jumper.